It's Monday again, so it's time for another color inspiration. This color combination is very spring inspired, perfect for an Easter related layout. 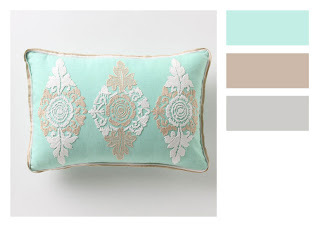 The colors are soft and delicate, suitable to compliment a spring theme. The picture is from www.anthropologie.com, You can find the pillow HERE (if the link does not work, maybe the item is sold out).